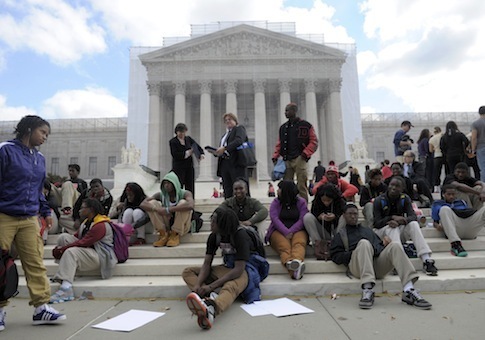 Support for affirmative action programs has hit record lows among Americans, according to a new NBC News/Wall Street Journal poll. Reasons for the trend range from the idea of "diversity fatigue" to what others believe is the effect of an African-American being elected president, as well as 20 years of anti-affirmative-action campaigns. "Right now, I feel like it’s reverse discrimination," said one poll respondent, a white, 69-year-old retired teacher from Rhode Island, who was interviewed for this story and did not wish to be identified. "I did support it at first, but, gradually, because of this reverse discrimination it’s gone too far." By the fast-approaching end of its term, the Supreme Court is expected to hand down a decision in a case determining whether the University of Texas admissions program violated the Constitution by using racial preferences. This entry was posted in National Security and tagged Affirmative Action, Progressive Movement. Bookmark the permalink.